Stephen Covey published the hugely popular self-help book, “The 7 Habits of Highly Effective People” in 1989. 14 million copies later, a number of copy-cat topics have surfaced across all disciplines, and you know marketing is on this bandwagon! Nevertheless, we think there is still an opportunity for another perspective. Perhaps a modern marketing filter? Thanks in advance for indulging. Of course, to begin such an assignment, a Google search quickly identifies several attempts at the subject. The search also results in some more focused topics like 7 habits of effective digital marketing, content marketing, and inbound marketing. During this exercise, I found, not surprisingly, an email marketing software vendor identifying data and CRM software as highly effective marketing habits. So perhaps the “7 Habits” topic is over-saturated? Let’s take a closer look. No question, content, inbound, social media are hot marketing topics. But what if we step back, and consider marketing from a broader perspective? Before we do, it’s worth acknowledging that there are huge differences between consumer marketing and business-to-business marketing. So can there be a single list of 7 Habits of Effective, lets call it, Modern Marketers? Lets give it a try. First, what hasn’t changed all these years is that marketers have to understand their customer, their audience, or typically multiple audiences. Consumer marketers must understand demographics, and likely psychographics. Business marketers should understand their market segmentation, possibly demographics, and most certainly, the decision-making process for their products or services. Second, most of us manage brands that have competition. So who are your competitors, and what is your positioning as it relates to competitors? How do consumers or customers perceive your brand? Competitor’s brands? What are points of differentiation? What is your unique selling or value proposition? Of course, market research might be required for this marketing requirement. Perceptual maps are great tools for plotting category brands by certain variables (see rock merchandise example below). This undertaking should drive branding, messaging, product strategy, truly everything. Ok, this hasn’t changed that much. Third, effective marketers develop and implement a marketing plan. Effective marketers don’t just react, they are proactive. We published a Marketing Planning & Budgeting Best Practices Guide that identifies and describes 4 types of marketing plans, a Marketing Planning Checklist, along with 3 methods for budgeting. It’s one of our most popular resources. By the way, the 4 types include Strategic Plans, Tactical Plans, Functional Plans, and Project Plans. Download our Guide here. Number 4. Surely, the most effective marketers are implementing multiple initiatives, using multiple channels. Often for multiple products and markets. Using multiple staff or agencies. Every initiative should have a deadline (effective marketers make deadlines). So managing, if not juggling all these disparate parts requires a marketing calendar, or calendars. Yes calendars can be in a marketing plan, but they can also be on giant whiteboards. In your Outlook. All the details, everywhere! Fifth, highly effective marketers practice digital excellence. We prefer the term digital to be inclusive of the many sub-disciplines of internet marketing—a term that now seems limiting. Certainly the website is foundational. Design aesthetics, user experience, landing and registration pages. With everything measured via analytics. To get there, search engine marketing (SEM) is required. Search can be subdivided by paid or organic. Paid or pay-per-click (PPC) includes Google Adwords, along with other networks. Organic (also called natural or free) search requires search engine optimization or SEO, and is more critical than ever. Why? Because search engines penalize websites without SEO excellence. Remember all those algorithm updates with names like Hummingbird, Panda, and Penguin? Each update requires a corresponding SEO action. Surely, a cornerstone of digital marketing excellence is content. Of course, content has to be effective (vs. fake news). Ideally, content can achieve thought leadership, especially for business or complex categories (think financial services vs. bubble gum). That said, content is a big subject, so check out our Content Marketing Guide for more information. No question, content is the fuel for another digital marketing channel, social media, that deserves its own number. 6 of 7. Social media is so mainstream and proven, there should be no questioning it’s effectiveness. That said, social changes daily. New networks, new tools and techniques. Now there is social advertising, and social commerce. So how does a marketer manage social for the greatest effectiveness? No question, social is different for business and consumer marketing scenarios. No question, LinkedIn rules business-to-business. As Facebook rules consumer. But Twitter and YouTube continue to be critical networks. While Pinterest and Instagram can be important to consumer and retail. Analytics prove social media everyday, which leads us to number 7. 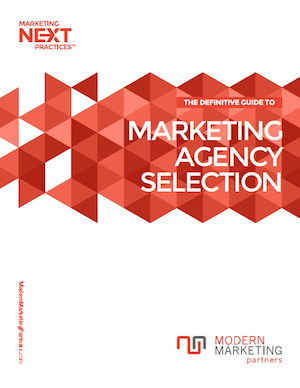 Last but not least, highly effective modern marketers measure and report frequently. Whether you call them metrics, analytics, key performance indicators (KPIs), dashboards, or Marketing Return on Investment (MROI); measuring and reporting identifies results, and ensures continued funding for successful marketing initiatives. And with the marketing mix evolving toward digital, there are more options for measuring and reporting than ever before, including marketing automation software. Depending on the scale of your marketing program, a typical reporting frequency can be weekly or monthly. There you have it. Yet another take on 7 Habits of highly effective—this time, highly effective modern marketers. Oh, and about that habit word. Usually the context is a bad habit, like smoking. In this case, I hope you agree that these 7 marketing imperatives are part of being a modern, effective marketer. What’s your take? Use the comment form to suggest a “habit” (of the marketing kind). This is a great 7 habits, however, I will suggest that brand building be added, as awareness is still a requirement before action can be taken. Advertising and/or publicity are key awareness building tactics. Thank you for your suggestion. No question, awareness is critical. Digital awareness can be achieved with these 7 habits, but publicity and advertising can achieve the broad awareness that is required for many markets and categories.